Elis Regina. This is the time of year where, as Spring arrives and clocks likewise “spring ahead”, we pay tribute to the woman who many consider to be Brazil’s greatest singer. So, for taking the time to learn more about Elis Regina, let me say ‘thanks’! March 17th marks another birthday for Elis Regina, but even those who only casually observed this singer’s meteoric career knew that fate would hold to a much shorter calendar. Elis Regina died at age 36 of a drug overdose on January 19th, 1982. It put a coda on a life that was filled with riotous emotion and more than enough music to sustain us after she had gone. Musically, singer Elis Regina carried her talent like an open book: propelling great emotion into her music, almost as if every song was part of her own life story. Today, Elis is still revered as Brazil’s greatest performer, but surprisingly little has been written about her life. Sure, you’ll find thumbnail bios and music tribute sites, but they’ll fail to get past the basics of what made Elis Regina one of Brazil’s very best performers and one of her generation’s pioneering women. Away from music, Elis was mother, a wife, a change agent for Brazil’s music industry and a very public supporter of women’s rights. In the mid-70s’ she underwrote the newspaper Nós Mulheres (We Women), published by the Women’s Association of Sao Paulo. Legends aren’t painted from paragraph-long bios. Elis Regina’s life was a combination of personal turmoil and creative release, framed by a dark and repressive period of Brazil’s history. “The stage is so closely linked to with my way of being, to my traumas, that I think that to separate myself from the stage would be like castrating a stud horse,” Elis once said. Brazil’s Dictatorship began in 1964, deflating Bossa Nova’s optimistic, innocent style and giving rise to the protest song as part of the popular movement against the suffocating presence of government control. 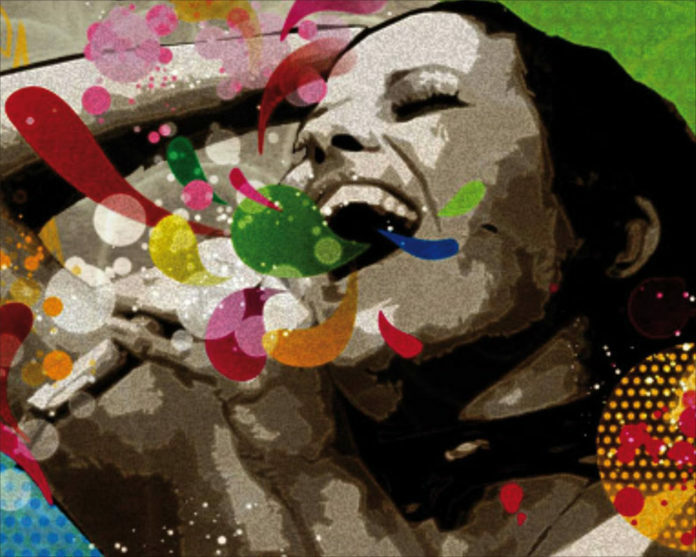 Elis Regina’s rise to popularity was contentious, but eventually her powerful emotion on stage endeared her to the nation and the legend grew from the contradictions that defined her life. She disliked Tropicália but counted Tropicália’s Rita Lee as a dear friend. She tolerated Antonio Carlos Jobim, calling him “that sacred cow of our music”. In fact, the feeling was mutual until they recorded together in Los Angeles to create Brazil’s most beloved song, ‘Águas de Março’ (The Waters of March). We might have been limited to these snippets of her life, if it hadn’t been for an unusual set of circumstances. Many years ago – on a now-defunct Yahoo Newsgroup – I came across a web-based, English language translation of Furacão Elis (Hurricane Elis), the wonderful but controversial biography penned by Regina Echeverria in 1985. Previously available only in its original Portuguese and in book-bound form, a Canadian fan named Robert St. Louis undertook the exacting task of translating the entire text into English. A few years later, I discovered that the newsgroup had been closed and the book was no longer available anywhere on the Internet. So, I tracked Robert down and offered to give his English translation of the book a permanent home on the internet. Happily, he agreed. As the first published biography on Elis Regina, the author came under fire from critics and some in Regina’s family publicly condemned it. Echeverria’s observations of her life are frank, but fair. But strong reaction from family members led to the book being pulled from stores and – until recently – subsequently ‘buried’ by the original publisher. There was a certain amount of fan backlash, too. Now you can read the entire book in English (all twelve chapters) anytime. It’s an unmatched look at the life and music of Brazil’s greatest female performer and I hope that it brings you as much enjoyment as it does for me to present it to you. Get started with Elis Regina’s life story here. You’ll find the link to her biography, too.